Deputy Chief Minister, Chowna Mein inaugurated two RCC Deck Steel Bridges over Obung and Pibung Nallah in Siang District. 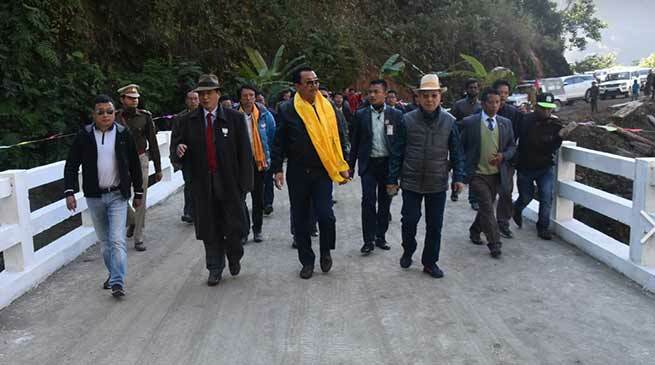 Deputy Chief Minister, Chowna Mein inaugurated two RCC Deck Steel Bridges over Obung Nallah and at over Pibung Nallah along the Kaying Gaseng Gate road (part – A of Phase – I) in Siang District here today. This road will connect border villages under Siang District. Addressing a public rally at Kaying Circle Headquarter, Mein said that the State Govt is committed to provide last mile connectivity. Underscoring the importance of road connectivity to the remote and far-flung areas, he called for judicious use of funds and quality implementation of the projects in toto. Replying to a proposal submitted by the Power Minister, Tamiyo Taga on the occasion, Mein assured to look into the construction of Part- B (Phase-I) of the Kaying Gaseng Gate road, road connectivity upto Payum Circle under RIDF or NESIDS in the next financial year, clearance of road project from Rumgong to Molom pending under NLCPR and also consider to look into the realignment of 1983 old road from Boleng to Kaying. Among others, Power Minister, Tamiyo Taga, MLA P D Sona and Nyamar Karbak, DC Rajeev Takhuk and SP K P Singh were also present.